out march 10th via greedhead/megaforce records. post-9/11 america was immediately disorienting; misguided patriotism swelled into expansive military conflict abroad while xenophobia at home acquired a strong new dimension. that composite sketch is the rough outline of eat pray thug, the debut solo effort from ex-das racist member heems. heems, the performance persona of himanshu suri, skirts around issues of race for much of the album’s opening third. strong references to heems’ brownness surface immediately on “sometimes,” but he takes his time to fully contextualize them and elaborate. early tracks like “so ny” pay homage to suri’s native queens (“i’m so new york i still don’t bump tupac” is the hands-down funniest declaration on eat pray thug), while “damn, girl” tackles the secondary love component that heems tacked on to the album. it isn’t until “flag shopping” hits that heems becomes overtly political, with visceral couplets like “we’re going flag shopping for american flags / they’re staring at our turbans, they’re calling them rags” and the less-direct but even more powerful “they want a shorter version, they want a nickname / that wanna toby us like we kunta kinte.” the song touches on conformity and assimilation issues, but is especially poignant when confronting a prevailing cultural ignorance that has grouped muslims with sikhs and hindus into a super-minority whose persecution is incessant and unwarranted. eat pray thug has its missteps, most of which are byproducts of the non-sequiturs and satirical nature that pervaded das racist material during that group’s tenure. 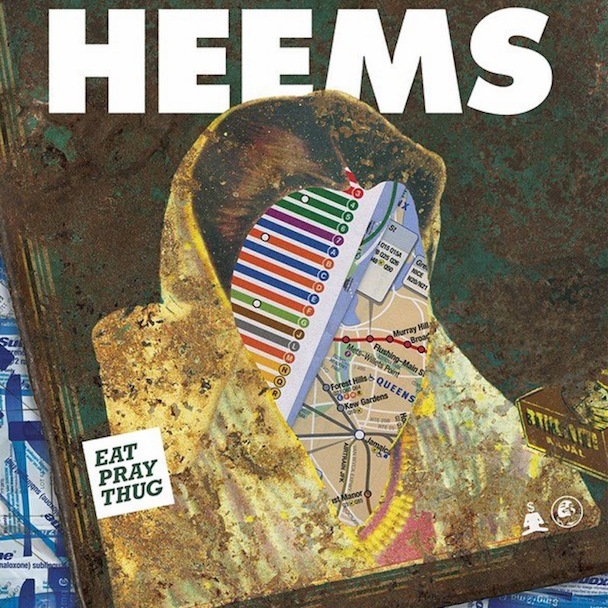 tracks like “pop song (games)” and the aforementioned “damn, girl” feel more like well-intentioned fillers, earnest attempts from heems to offer up a multi-faceted body of work, but his most powerful material surrounds a topic grossly underrepresented in hip-hop and cultural commentary in general; perhaps he might have done well to condense eat pray thug into a more succinct product. case in point: “al q8a,” “suicide by cop,” and “patriot act” comprise the defining triptych of the album. “al q8a” and “suicide by cop” both hinge largely on heems’ established affinity for deft wordplay, strong narrative, and searing sarcasm, but “patriot act” literally spells out major instances of racial profiling experienced by suri, his family, and his friends over and over until the injustices and shortcomings are permanently branded in the audience’s collective conscience. it’s here that the lines finally blur between himanshu suri the person and heems the performer; it’s here that eat pray thug realizes its full potential.